The Small Scale Raiding Force (SSRF) was one of several irregular special forces formed in the Second World War. Using a specially adapted motor torpedo boat the SSRF carried out three successful cross-Channel raids before disaster struck on the fourth such raid when all 10 SSRF raiders, including Force founder Gus March Phillips, were killed or captured. Despite the blow, SSRF raided the island of Sark less than a week later. This is the thrilling story of the Force and its heroic personnel. 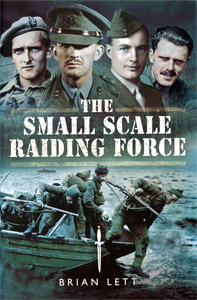 The Small Scale Raiding Force (SSRF) was formed in February 1942 by Gus March Phillips with Major General Gubbins SOE European chief’s approval. March-Phillips and his Maid of Honor Force had just had complete success with their operation (POSTMASTER) off West Africa. Equipped with a specially adapted motor torpedo boat, the SSRF immediately started planning for operations. Op FROUDESLEY, with the aim of destroying the battleship Tirpitz ran into technical problems and was delayed but, in August and September, three daring cross Channel missions were successfully carried out without loss. The author describes these and the disastrous fourth operation (ACQUATINT) when all 10 SSRF men, including March-Phillips were killed or captured. Despite this hammerblow, SSRF now commanded by Geoffrey Appleyard made two raids on Sark a week later. Again their story is fully told in this fascinating book along with those of three further 1942 raids. Inter-service rivalry (‘the war within’) led to the break-up of the SSRF in early 1943. The Author describes the many colourful characters who made up this special force including Anders Lassen VC, Graham Hayes and Andre Desgranges, the Free Frenchman whom the Gestapo ‘turned’. This superbly researched book lifts the veil on a little known but highly effective special force unit and the gallant individuals who served in it.